Now that even an enviroskeptic like Ronald Bailey is convinced that climate change is happening, it should come as no surprise that the Bulletin of the Atomic Scientists (BAS) has turned their attention to global warming. 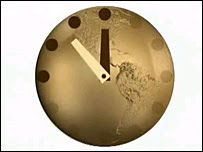 For the first time in history the infamous Doomsday Clock was moved ahead for environmental reasons; climate change now joins nuclear annihilation as one of the greatest threats to face humanity. The clock was incremented by 2 minutes and now stands at 5 minutes to midnight. The decision to do so was reached by a number of experts, including BAS directors and affiliated scientists such as Sir Martin Rees and Stephen Hawking. Kennette Benedict, executive director of the Chicago-based BAS, noted that “When we think about what technologies besides nuclear weapons could produce such devastation to the planet, we quickly came to carbon-emitting technologies.” Rees added that “Humankind’s collective impacts on the biosphere, climate and oceans are unprecedented.” Stephen Hawking released a video statement in which he makes similar warnings. Specific fears included rising sea levels, heat waves and desertification. It is also feared that there will be new disease outbreaks and wars over arable land and water. Global warming poses a dire threat to human civilization that is second only to nuclear weapons. The most authoritative scientific group on these issues, the Intergovernmental Panel on Climate Change (IPCC), has concluded, “Most of the warming observed over the last 50 years is attributable to human activities.” Carbon dioxide, principally from fossil fuel burning, has been accumulating in the atmosphere, where it acts like a blanket keeping Earth warm and heating up its surface, ocean, and atmosphere. As a result, current levels of carbon dioxide in the atmosphere are higher than at any time during the last 650,000 years. Also added to the list of threats are those posed by the emerging life science technologies, such as synthetic biology and genetic modification. While the risks associated with global warming are severe, I am unconvinced that they qualify as extinction risks. More problematic would be a feedback and runaway greenhouse gas effect in which rising temperatures would move beyond human control. It is feared that such a catastrophe would convert the Earth into a Venus-like planet where temperatures would exceed 400°C. And indeed, the BAS did note this grim possibility in their review. Historic and unprecedented as it is to include climate and biotech, it is my opinion that the BAS is still ignoring or underestimating a number of potential catastrophic risks. While I can understand their reluctance to include technologies that do not yet exist, the mere theoretical possibility and burgeoning development of such things as molecular nanotechnology, anti-matter weapons, and artificial superintelligence should at the very least be acknowledged. It’s never too early to start planning and formulating potential prescriptions for threats that may result in the extinction of the human species.